When it comes to weight loss, or rather, fat loss, many people’s first concern is burning calories. It’s a long-held belief that creating a caloric deficit — where you burn more calories than you take in — can help you drop a few pounds or sizes. While cardio exercises, like running or walking, are often seen as the best way to do this, it turns out weightlifting can help, too. To understand the relationship between weights and calories, you need to know the difference between aerobic and anaerobic exercise. 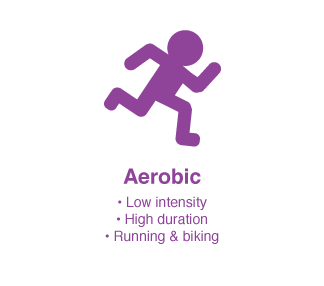 Sustained aerobic exercise, like steady jogging or cycling, is low intensity and can thus be done for a longer period of time. Your body gets enough oxygen to ensure that you can keep doing what you’re doing. 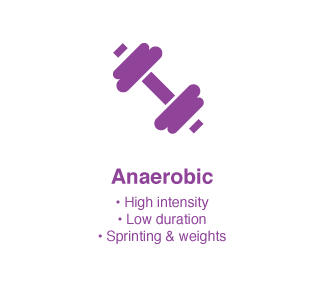 Anaerobicexercise, like weightlifting, on the other hand, is high intensity. With quick bursts of high intensity exercise, your body doesn’t get enough oxygen to supply your muscles quickly enough, so your cells start to break down sugars instead. Since this level of intensity cannot be maintained for very long, anaerobic exercise tends to be short-lived. “Strength training is not a highly aerobic exercise, so many people believe that it is not a good way to burn fat,” explains Rocky Snyder, CSCS, NSCA-CPT, of Rocky’s Fitness Center in Santa Cruz, CA. Snyder says that they are correct in some ways, but that strength training can burn fat in ways that other exercise cannot. Anaerobic exercise may be short-lived, but its calorie-burning effects are not. In other words, more intense exercises such as weight and strength training burn calories and fat for a longer time post-exercise than lower intensity aerobic exercises. Snyder says the best workout regimen is one that incorporates both aerobic and anaerobic exercise, but adds that lifting weights can provide some additional benefits. “The added benefit to lifting weights is the adaptation the muscles experience,” he explains. “The muscles will grow in size and increase in force production, or strength.” And it’s this muscle growth that leads to another beneficial side effect — a boost in metabolism. Which Moves Burn the Most? The weightlifting moves that use multiple muscles are the ones that build the most muscle. Snyder says you can try these five moves with no added weight (using only body weight for resistance). Then start adding weights for a bigger gain. Learn how to do perfect squats, lunges, and deadlifts! As with any exercise program, Snyder says there are risks. When you begin a strength training routine with no guidance, not only do you risk poor form, you’re also at risk for injury. Enlist the assistance of a personal trainer who is familiar with biomechanics. They can show you the proper form, plus help you improve your posture and movements. Lifting weights burns some calories. Its real benefit is that it can also help build muscle, add strength, and even improve bone density and When added to an exercise regimen that includes aerobic exercise and stretching, it delivers maximum benefit. Run Before or After Workout: Should I Lift or Do Cardio First? Cross-training is an important part of a well-rounded workout routine, but cardio is still essential. So should you run before or after your workout? There are many effective things you can do to improve your health. Here are 27 health and nutrition tips that are actually based on good science. The best places on the web to get the workout regimens, motivation, and advice to help you keep fitness a part of your healthy lifestyle.